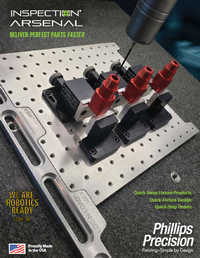 Phillips Precision, Inc., is a modern, innovative and well respected full-service machine shop and manufacturer of unique work holding products. Our ISO9001:2015 registered machine shop has a dual role: specializing in short run production and complex prototypes for any industry and functioning as a manufacturing laboratory. The products division manufactures and sells the company’s unique, industry-leading work holding products. Phillips Precision provides machining services to any number of local and national customers in the paper, auto racing, food/beverage, electronics industries… and many more. Whenever you eat a Table Talk Pie you can think of Phillips Precision since we re-manufactured most of their line – including the crimping dies. When Bill Belichick tosses his headset to the ground, think of us – we make some of the components for the Bose sound cancellation headset. The shop is filled with CNC milling and turning centers, including a 500mm CNC horizontal mill, and offers 3D printing, grinding, honing, laser marking services, assembly and more. We’ll assure the highest quality of your parts through our complete inspection department. We program with the latest CAD/CAM software with solids, we create using OnShape and SolidWorks Pro, and run our operations using E2 Shoptech software. Inventor and co-owner, Steven Phillips develops products to solve problems in his own manufacturing processes and has a knack for creating unique, simple, highly effective and affordable designs. Steve developed Pitbull Clamp® more than 20 years ago – the lowest profile and strongest work holding clamp of its size. Pitbull Clamp® has the strongest rip-out resistance of any clamp on the market and is sold all over the world helping manufacturers maximize feeds and speeds and increase job profitability. More recently, Steve designed industry-leading fixture plates and work holding components for inspection, laser marking, assembly, and more. Inspection Arsenal™ and Laser Arsenal™ are universal, quick-swap, LEAN fixture plates and clamps that are really catching fire and saving manufacturers tens of thousands of dollars. Companies like Milwaukee Tool are swapping over their quality departments world-wide, Triangle Manufacturing, Kennebec Technologies and hundreds more now use Inspection Arsenal™ exclusively in their metrology labs. Local companies like Central Coating use Laser Arsenal™ plates to speed up their in-house laser marking services. Many of the OEMs for both inspection and laser machines recommend our Inspection Arsenal™ and Laser Arsenal™ systems for its industry-changing techniques. With all the talent and technology under one roof, Phillips Precision is able to produce new products at record speed. Combining the best of both worlds. As a machining laboratory, Phillips Precision provides customized fixture plates and fixture design services. 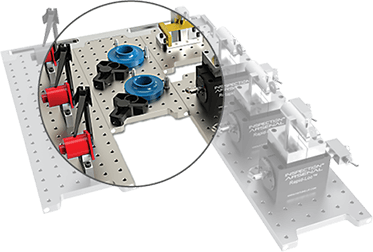 Most solutions are created using our standard quick-swap fixturing or customized workholding components and setups. Using the Loc-N-Load™ quick-swap fixture plates and quick-change workholding, your inspection and laser marking processes will be significantly faster, increasing profits. As a team we work to ensure compliant, high quality parts are delivered to customers on-time, every time. We minimize risk to customers through good communication and continuous improvement of processes, technology, and talent. 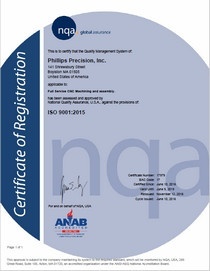 ISO 9001:2015 Certification after successfully applying a quality system for the Full Service CNC Machining and assembly from CIC Management, LLC. They were one of the first CNC Machine Shops in New England to become certified to the 2015 International Standard. Phillips’ dedication to continuous improvement and employee empowerment contributed heavily to this important achievement.